The Greek mathematical genius is no stranger to history: Euclid of the distance and Pythagoras of the triangle, to start with. Using his own 20th century mathematical genius to create musical structures of a completely other aesthetic dimension, Iannis Xenakis expanded the rhythmic and musical conceptual capacities of countless musicians. He consolidated hitherto untethered art processes of music and architecture, allowing composers to see that they may follow the same conceptual paths as mathematicians. But Xenakis was famously fell out with his teacher, Honegger, who claimed his creations “weren’t music.” A prodigious architect for Le Corbusier, Xenakis entered the post-WWII Paris music scene with the power to realise majestic physical structures of beauty, and sheer will to apply these musically foreign processes to sound structures. The great Messiaen saw something quite different in Xenakis’ untrained potential, and in what has to be the most hilarious doctoral thesis defence ever given, instead of grilling Xenakis on the canon, Messiaen began by insisting Xenakis himself was a giant figure in music for creating a new system while Xenakis sincerely attempted to defend a position of modesty. The parameter of disorder-to-order is the most pertinent in this music as it reflects Xenakis’ deep sense of cultural and social responsibility in his art. He believed that artistic forms created environments for political structures, and that without allowances for random events and aggregations, if the standard deviation is too low in music, this could amount to an expression of totalitarianism. Therefore the keyboard works build upon scaffolds of unpredictability, in places literally unplayable in all prescribed dimensions, meaning that the performer’s choice of how best to realise the ideal is integral to the works. In 2008 Daniel Grossman realised these same works that de Jager explores but used computer MIDI programming and so missed Xenakis’ concept entirely in terms of both political ideals and closing off the potential for the composer’s intended transformation of the performer. Peter de Jager’s choice to perform these five works shows artistic integrity, mental might and chops, chops, chops. He played two marathon concerts of the same program and I, like others in the audience, attended the first and returned for the second. In Evryali, de Jager’s lines were fluid and sweeping, a complete other world to the chopping, rhythmic play of the opening, leading to the most beautiful execution of the sparse, pointillistic seven bars, each note created with unique astral intensity and placement. De Jager creates uncannily clear contrapuntal journeys via the expansive block chords, remaining true to close, lower-register voicing, eliciting the most captivatingly secure and organically transfigured syncopations. De Jager’s Khoaï is high drama for the left hand, with digital beep codes in the upper register for the right, both conveyed without tainting and impressively unreactive to each other. The thumping of the harpsichord’s pedals lends the piece the quality of a censored organ’s foot manual, determined to be heard regardless. The expansions of register with increasingly drastic changes of tone were spine-tingling. Wild polyrhythms with both dynamic and timbral short leashes made de Jager a musical lion tamer. After the landmark bar’s silence, the sextuplets, quintuplet and nested triplets and duplets are hair-raisingly energised. An expectation-thwarting ending of an exponential reduction of musical density and energy drops seemingly towards silence only to be interrupted by a final shattering resonance. Returning to the piano timbre for Mists brings us back to the expansive resonances that evoke the title of the piece. A juicy B-flat bass line repeated only twice, allows de Jager to convey a moment of jazz idiom with weight and placement for our ears to sink into. The first phrase ends with a tense resonant cluster, and in the second the resonance-structure seemingly hovers over the piano, vividly realised with angelic tone colour. Naama, far from the nebula of Mists, hits out with clear lines of time-marking and a gradual increase in intensity, tempered by skipping rhythms. The insistent metallic power chords lead from a controlled robotic waltz, to ironic anthem and then return. De Jager pounds the low register to the limit and gives serious anchorage to frenetic rhythms. This motif then leads to cascading right-hand passages. For the final work, the epic Herma, de Jager uses a sensitive touch and a tempo that allows the space to breathe. 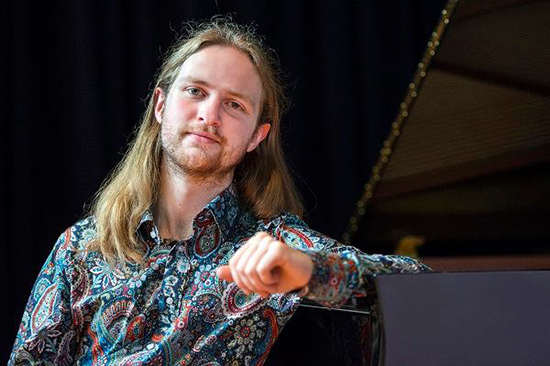 He employs formal rigour and thematic pitch sets, with weighted meaningful legato contrasting with the stamping resonances of the final grandly integrated super-pitch-set. Choking the final chord, he springs away from the keyboard so abruptly that these musical models keep pounding away in the listener’s mind long after the rounds and rounds of standing ovations and cheers and whoops subside. 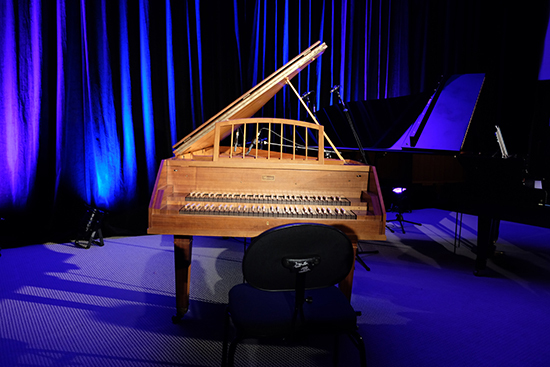 Alternating between piano and harpsichord was perhaps a kindness to the marathon-related risk of audience timbral saturation, and testament to Peter de Jager’s physical dexterity and adaptability. The symmetrical programming of the works seemed a little classically formed but I guess a stochastic method could still result in this same form. But this wouldn’t bother Messiaen…I happily promulgate the event of the local bird-life resonantly chirping accompaniment to de Jager’s performance of Mists as a cheeky, symbolic nod of approval from Messiaen.